When to see a vet. That’s what we’re going to be talking about today. To most dog owners, this may seem like an odd post to write. After all, most of us take our dogs to the vet whenever they show any signs of being off. However, I have seen so many questions in various threads over the course of writing my posts that actually ask when to see a vet, that I decided to address this. The question that finally did it for me was from an owner who asked if he should take his dog to the vet. He said his 1o pound Cockapoo ate two of his “special” brownies and that the dog was nearly unresponsive. I mean, seriously. I don’t want to get preachy. This post is all about information. But come on… The fact that a person had to ask if they should take their nearly unresponsive dog to the vet let me know that this post was long overdue. So, hopefully, we all know that if our dogs are stoned to the bone, it’s probably a good idea to take them to the vet for a good once over. FYI, THC has not been shown to be dangerous to dogs, but the chocolate in the brownies is. But I digress. Let’s break down when it’s advisable to see a vet. If you suspect for any reason that your dog may have eaten any sort of object, take him to the vet. Although small objects will most likely pass on their own, large objects can cause blockages or even death. Many foods that humans eat can be toxic to dogs. If your dog eats chocolate, onions, grapes, raisins, or anything that’s sugar-free, take him to the vet right away. Why are sugar-free foods dangerous? Most of them contain xylitol, which is absolutely deadly to dogs. If your dog is injured, take him to the vet. While your dog may only have soft tissue damage, the untrained owner cannot know with certainly when to see a vet in these situations. It’s better to err on the side of caution with injuries. Obviously, if your dog is sick, you’ll want to take him to the vet. The primary symptoms that something is wrong are vomiting, diarrhea, lack of appetite, excessive urination, being overly tired. If your dog has swelling, a rash, itching, or a combination of these, take him in to see the vet. These could be symptoms of anything from skin allergies to a bug bite, and it’s important to address them. In the veterinary field, we have a diagnosis called AQR. This is short for Ain’t Quite Right. If your dog seems off in any way, take him to the vet. Dogs are stinkers, and he could have gotten into anything from food to a pointy object while your back was turned. This is the sort of “catch all” reason to take your dog into the vet, and it should always be taken seriously. A good rule of thumb that I learned in my many years of working at a vet is that when you don’t know what’s happening is when to see a vet. If your dog looks off in any way, it’s time to see a vet. If your dog has what appears to be a mild injury, it’s time to see a vet. The problem with dogs is that they have a high, high threshold for pain and discomfort, so it’s up to us to ensure that we are vigilant about their health. That’s why I put together this list. The biggest takeaway I hope that every owner gets from this post is that if you are unsure, that’s when to see a vet. 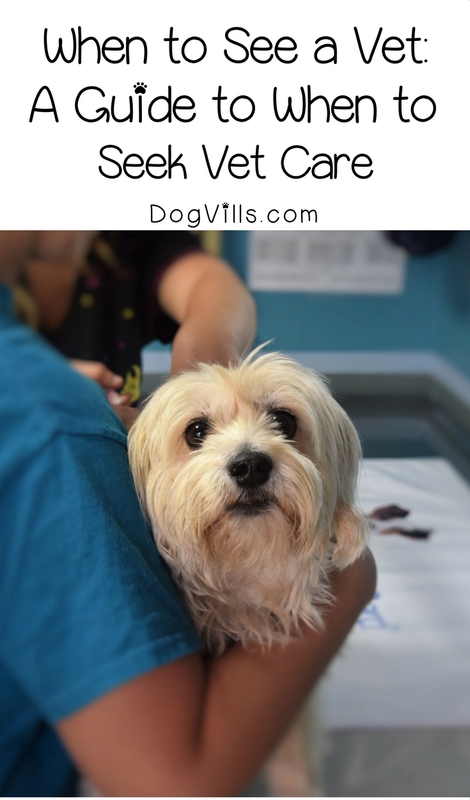 Do you have any other questions about when to see a vet? Share your own experiences below!